3D floorplans are a must for venues and caterers today given our technologically advanced climate. Using 3D diagram software to create the floorplans for your events offers numerous planning benefits while providing operational efficiency, ROI, and value for everyone involved in the event. 3D floorplans provide a collaborative environment for you to work with your clients and vendor team in real time from wherever you are during the planning process. 3D diagram software offers life-like viewing of floorplan layouts which effectively help to display an event’s logistics, flow and set-up. With the use of 3D diagram software, you receive an ultra clear picture of the event before it even happens which gives everyone involved in the planning of an event the opportunity to envision the flow of the floorplan. If any changes need to be made, they are discovered during this part of the planning stage so that they are handled in advance of the event. 3D floorplans bring your event to life while you are still in the event planning stages. For example, when using the 3D diagram software viewing features within your AllSeated account, you can best create, assess and visualize your layout to determine if changes should be made before the day of the event. Without 3D diagram software, your floorplan layout is not clear, making it much more difficult to visualize the end result in advance of the event. Everyone wants a seamless event set up and execution, right? With enhanced visualization through using 3D diagram software with floorplans designed to scale within AllSeated, you are best equipped to design your floorplan layout accurately, leaving less room for error on the day of the event. 3D floorplans provide opportunity for virtual walkthroughs of your event layout before it happens! Not only do 3D floorplans save you time, they eliminate the need for on-site and in-person meetings. This plays a HUGE role in the planning of events, especially destination weddings and other destination events! Our designer tools allow you to build tabletop and buffet displays to-scale within your floorplans. See exactly what fits to-scale on the tabletops in your floorplans — no more guesswork! The table builder and buffet designer tools currently include options for place settings, flowers, centerpieces, linens, and buffet pieces, with many more objects to come. Here’s a quick video about our designer tools! Experience your event before it even happens using AllSeated’s amazing virtual reality technology! AllSeated’s special Virtual Reality goggles allow you to tour your 3D future event layout in a realistic simulation. Learn more about AllSeated’s VR in this video along with the 3 easy steps for getting started here. The AllSeated VR technology is event industry’s first/only genuine virtual reality capability. 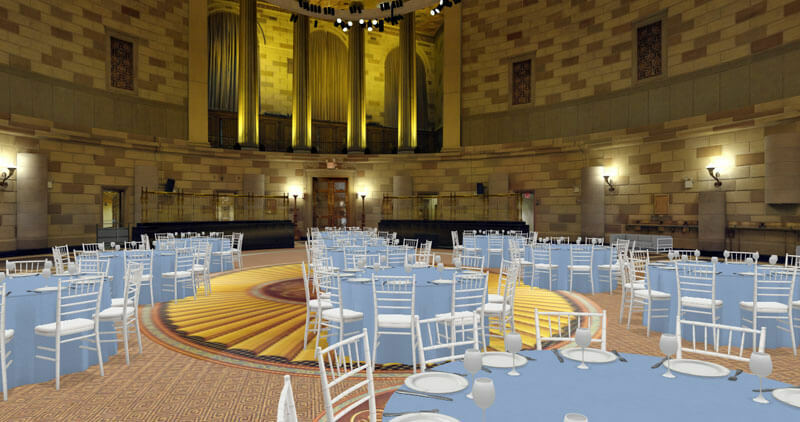 AllSeated’s VR offers seamless 3D renderings, sending customers on a virtual walkthrough of your venue from anywhere in the world. Visitors can tour the venue in 360 degrees, preview their tables and furniture, and even view a custom setup in virtual reality to achieve photorealistic immersion into your venue months before their event takes place. Learn more about AllSeated’s VR in this video!